We feel so supported by our friends who give on a monthly basis. It's not even the amount - it's the regularity, the commitment, that resonates. 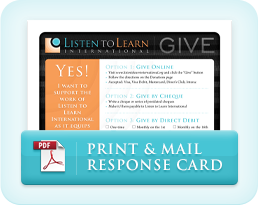 We show our appreciation by making available to you once a month a free download of one of the teachings we use in our curriculum. The good teaching partners who provide us with our teaching content have permitted this, and we connect you with their web stores if you should want to pursue the series further. A link for this download will come by email to our Listening Partners. L2L Ministry PartnersWe are a service TO churches of the majority world, and we believe our primary support should come FROM churches. We can be one arm of your worldwide ministry. If you would like a representative to discuss this further with you, meet with your mission committee, or speak at a special mission service, please contact us. L2L Riding PartnersYou can even contribute without giving money! Once a year L2L has several teams riding on its behalf in the Ride for Refuge. Join as a Team Captain or a Rider and let your legs power one of our MP3 players for a while.